Simeon Hunt was one of the pioneers of Rodman as well as the Black River country, born in Coventry (Connetticut) in 1773 and since 1798 married to Roxalina Moody. In 1803, the young couple came to Rodman and Hunt built a log cabin which he soon turned into a tavern. When the town of Adams (which originally included Rodman) was organized, Simeon Hunt became one of its first town officers. After Rodman had been set off from Adams, he was frequently elected to important positions, and town meetings were generally held at his tavern. Hunt was known as a great violin player until a tree felling accident deprived him of the free use of his bow arm, nonetheless he managed to run his farm and the tavern (later hotel) and also owned a good grist mill as well as a saw mill until he died in fall 1831 after his wife Roxalia had already passed away in May of that year. Their only son was Benjamin Franklin Hunt, born 1810 in Rodman. He spent his young life on the home farm, working there during the summer season and attending district school in the winter until he started to teach winter school at the age of sixteen, still doing farm work in the summer. Following the death of his parents he took over the responsibility of maintaining the farm and other property. In 1832 Hunt embarked in mercantile business in Kingston (Canada), but on account of the cholera epidemics of 1832 and 1834 he returned and purchased a large farm in Rutland, later (1835) marrying Sarah, daughter of Daniel Talcott (a pioneer of Adams). Together they had four children, one of which died shortly after birth. All of their other children moved on to influential postitions: Daniel F. Talcott-Hunt (later Chicago) was for years connected to the Rochester Post-Express. Frederick S. Hunt (later Bridgeport) together with his father founded and managed the first ninety-nine cent store of the East. And Benjamin F. Hunt jr. (later Boston) became a successful businessman. After the death of his wife in 1844 Benjamin F. Hunt sr. sold out and returned to his birth town Rodman where he went into mercantile business with Robert S. West until he in 1857 moved to Monroe county, becoming the Canadian agent for the Briggs Brothers of Rochester. In 1873 Hunt once again moved, this time to Bridgeport (Connetticut) where he entered a partnership with his son, Frederick S. Hunt and successfully carried on business until he finally retired late in 1894, roughly a year after his second wife Louisa L. Hunt (née Greenleaf) had died. In October 1897 Hunt married once again, this time Julia A. Sherman. She was the widow of the late John Avery Sherman, one of most influential and honored men in Watertown, and the marriage drew attendance as well as congratulations from all over the land. The last period of his fulfilled life was pleasant but short as Hunt, who had always been of remarkable health despite his advanced age, passed away peacefully on April 7th 1898. It was Benjamin F. Hunt jr. who founded the retail company in Boston, however the exact year of founding is not known to me. It must have been long before 1896 as Hunt jr. is mentioned to have been in the business "years" before he started to become actively involved with Bohemian porcelain. Anyway, business concentrated on selling a large array of china and earthenware including coffee and tea sets, cups and saucers, kitchenware, vases as well as a lot of decorative porcelain and giftware. Hunt knew which items he could easily resell in Boston and wanting to influence those items directly, he joined the porcelain company of Karl Speck from the Bohemian town of Elbogen in 1897. It should be mentioned that he functioned as financial backer of the company and was merely a partner of proprietor Karl Speck, claims that Hunt alone actually owned the factory are incorrect. As the partnership with Speck in the end did not deliver the promised results, Hunt slowly reduced his financial activity there and in 1901 quit company. During the next three years he concentrated on increasing his knowledge, together with his wife Eleonora from 1901 onwards refining their skills on porcelain decorating by running a small decoration studio in Elbogen on a private (non-business) basis. In 1904 he then applied for permission to establish his own porcelain factory in the town of Grünlas after purchasing the former Dampfziegelfabrik Radherr, an abandoned brick factory. Construction of the new factory started in late 1904 after Hunt together with his wife had founded a limited liability company with the name Egerländer Porzellanfabrik Elbogen G.m.b.H..
Elbogen (later Czech 'Loket') and Grünlas (later Czech 'Loučky') were neighboring towns, Elbogen itself being better known as the historic main town in that region and a melting pot of all kinds of art movements, while Grünlas was the location of the regional registration office and most industry. This should be mentioned as many people ask themselves why Hunt founded his factory in Grünlas but included the name Elbogen in the company name. On June 15th 1907 the administration of Grünlas gave written approval to Benjamin Franklin Hunt as representative of Benjamin F. Hunt & Sons, Boston for the construction of his porcelain factory. One should hold in mind that it was common practice in those times that businessmen received a go-ahead during application while it could take years (cases of five years or more are documented) before the town or regional administration found time to finish all the required paperwork and make it official! Hunt however had other problems as his house bank in Boston had turned bankrupt, meaning that he himself became insolvent and was forced to sell the still not complete factory to Ludwig Engel & Sohn in 1908 before returning home to Boston, never recovering from the blow. 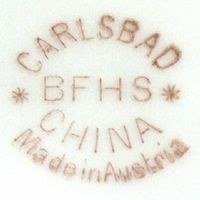 It is claimed that Hunt jr. at some time also ordered items for his Boston business at the ⇒Porzellanfabrik Wehinger & Co. from the town of Horn (a company which itself in that form only had been established in 1905) and these items are said to have carried a customized mark (see below). 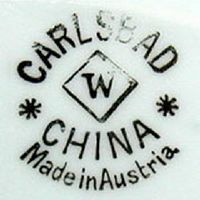 That however is so far unverified and should be taken with a pinch of salt as it is (as far as I know) merely based on the assumption that the included 'W' stood for Wehinger - it could just as well have stood for any other factory from the region. 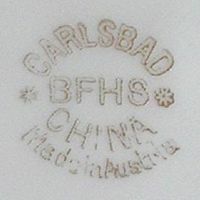 When looking at items with the 'BFHS' mark one should hold in mind that this mark was used only in Elbogen at the Karl Speck factory as well as during the period Hunt and his wife privately decorated items. The factory in Grünlas under Hunt did not really produce anything except six batches of undecorated whiteware resulting from the first firings before the factory was sold again. Claimed to have been used on items produced for Benjamin F. Hunt & Sons in Boston by Wehinger & Co., see Comment(s) above. Used between 1897 and 1907 on items produced in Elbogen for Benjamin F. Hunt & Sons in Boston. Used between 1897 and 1907 on items produced in Elbogen for Benjamin F. Hunt & Sons in Boston, gold version.